Juliet on my daughter (who is also Juliet), and Juliet on a hanger. The colors of the pic on the hanger are more true. 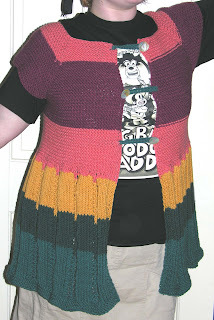 Yes, that is concert merch under the momknit. 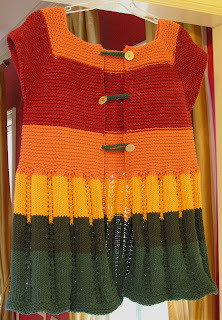 I am sewing a munchkin dress for a local production of “oz” now. The munchkin is 5 years old, and the daughter of a friend. They need the costume by Wednesday, so I’ll have a picture of it around then. Then I can at last get back to my Bee stole. 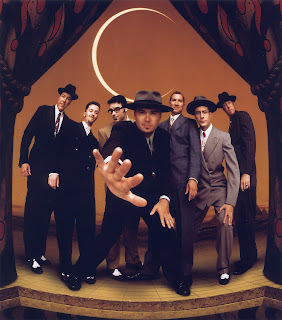 Just got back from seeing Big Bad Voodoo Daddy at the Carolina Theatre in Durham. You can see them here: http://www.bbvd.com/mainhall.asp They do put on a good show. Play “Mr. Pinstripe Suit.” For you knitters, Juliet is finished 2 days ago, I have a pic on a hanger, haven’t made the model stay still long enough to get one on a person. Will post it in the morning.